Jesus’ birth in Bethlehem is indisputable. WAS JESUS REALLY BORN IN BETHLEHEM? 1. The Gospels of Matthew and Luke clearly state that Jesus was born in Bethlehem (see Matthew 2:1; Luke 2: 1-7). 2. None of the remaining 25 books of the New Testament contradict the claim in Matthew and Luke that Jesus was born in Bethlehem. “No source has been discovered to date that disproves Jesus’ birth in Bethlehem” (In the Fullness of Time, p. 32). “Unlike midrash, the evangelist’s story of Jesus is not founded on an Old Testament text. Whereas midrash seeks to mine deeper meanings of the Old Testament, Matthew does not seek to interpret the Old Testament for its own sake. More to the point, Matthew is not retelling Old Testament episodes but is telling an entirely new story! It is a story with new characters and events; it is a story that could stand on its own apart from his Old Testament citations. Matthew employs the Old Testament to illuminate the significance of Jesus’ birth, not to determine in advance its plot and outcome” (Ignatius Catholic Study Bible, p.10). “The infancy narratives [of Matthew and Luke] are not a meditation presented under the guise of stories, but the converse: Matthew is recounting real history, theologically thought through and interpreted, and thus he helps us to understand the mystery of Jesus more deeply. What Matthew and Luke set out to do, each in his own way, was not to tell ‘stories’ but to write history, real history that actually happened, admittedly interpreted and understood in the context of the word of God” (from Jesus of Nazareth: The Infancy Narratives, 119, 17 as quoted in Joy To The World). 6. Moreover, Luke the historian assures us in his Gospel that he is delivering to his readers “a narrative of things that have been accomplished among us, just as they were delivered to us by those who from the beginning were eyewitnesses and ministers of the word” and that Luke has “followed all things closely for some time past, to write an orderly account…that you may know the truth concerning” the life of Jesus (Luke 1: 1-4). Luke assures his readers, therefore, that he has made considerable efforts to present a true and accurate history of the life of Jesus. “Nothing is more important in establishing the authenticity of an ancient site than antiquity: the place must have been regarded as such from the earliest times. If the Church of the Nativity [in Bethlehem] had been built here in 600 A.D., for example, its claim to mark the authentic site of the birth of Jesus would be almost worthless. But Constantine the Great, the first Christian emperor of Rome, erected the original Church of the Nativity at this place in 326 A.D., over the very grotto that had been identified as the true site by the early church father Origen and, before him, Justin Martyr. Writing in 150 A.D. Justin stated that Jesus was born in a cave that was used as a stable – not the typical stone or wooden stable so familiar in Christian art. Earlier still, in the 130s, the Pagan Roman Emperor Hadrian tried to desecrate the Jewish and Christian holy places in Palestine, but ironically, thereby preserved their identity” (In the Fullness of Time, 38-39)! “Justin Martyr…was born around AD 100…some forty miles north of Bethlehem. He knew the people and the area quite well, and he knew the site of a ‘certain cave’ that the locals venerated as the place of Jesus’ birth – even at that early date. He simply mentions that local Christians took care to preserve the historical memory of the nativity. In the century after Justin’s account…Origen made his own pilgrimage to Bethlehem and wrote: ‘At Bethlehem the cave is shown where he [Jesus] was born…and this sight is greatly talked about in surrounding places, even among the enemies of the faith. They say that in this cave Jesus was born….” (Joy to the World, p. 17). 9. The great Biblical archaeologist, Father Jerome Murphy-O’Conner, thus concludes that Jesus’ birth in Bethlehem is indisputable. “If the early Church thought of Jesus in terms of Davidic messianism – and it certainly did – it was not because of anything Jesus said or did but because of who he was and where he came from. And he came from Bethlehem” (“WhereWas Jesus Born?”, Bible Review, Feb. 2000, p. 54 as cited in Joy To The World, p. 106). 10. Based on the Gospels of Matthew and Luke, and confirmed by the post New Testament historical evidence regarding the location of Jesus’ birth, the overwhelming weight of the evidence supports the sound conclusion that Jesus was born in Bethlehem. 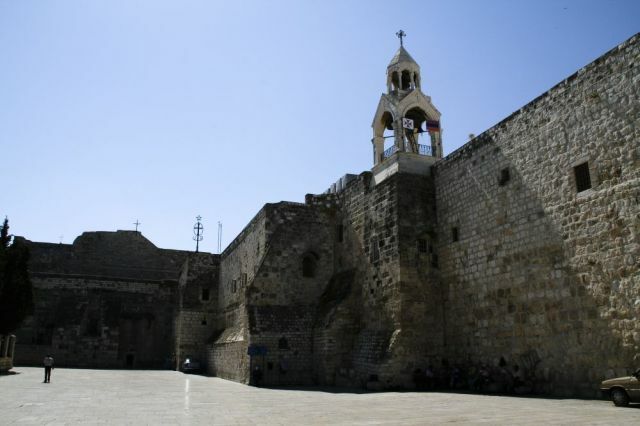 Image Attribution: This picture of the Church of the Nativity on Wikipedia is by Ian and Wendy Sewell, July 2007, and is used pursuant to the Creative Commons Attribution-Share Alike 3.0 Unported license. To SHARE on SOCIAL MEDIA: click on “Leave a comment” or “Comments” below (and this will bring up social media icons if they are not already present). To LEAVE A COMMENT: click on “Leave a comment” or “Comments” below, and then scroll down to the box which says, “Leave Your Own Comment Here,” which is at the end of any comments already made. If the comment section is already present, merely scroll to the end of any comments already made. Any ads in this note are by WordPress and not CatholicStrength. WHO WAS SAVED IN THE SCARLET LETTER?